"The application, named "we're in" and built by the Bing team, is exclusively available to Windows Phone users. We're in allows users to join a virtual group and share their location." 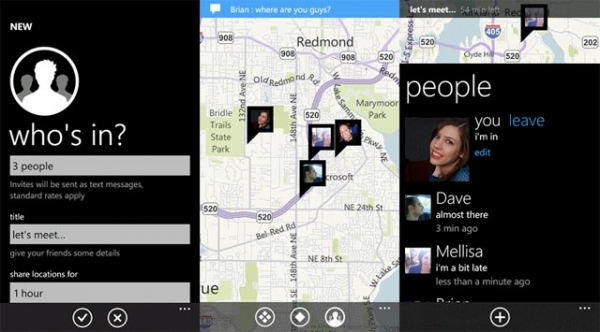 Microsoft's Bing Mobile Team has just released a location aware meeting app called "We're In." Unlike other mobile apps created by Microsoft, "We're In" is currently exclusive to the Windows Phone 7 OS. It allows users to join a virtual group and automatically share their location. Users invite friends to a virtual meeting by their mobile numbers. The app then shares locations of all invitees which automatically expires at the end of the preset meeting time. "We're In" is available for download now in the Marketplace. Is it too much asking these MS geniuses to spend some time to create a freaking app to allow users of WP7 to backup their SMS?!?!?!?!?!?! We had it with WM but after almost a year since the launch of the new OS WP7 users are still unable to accomplish such a simple task!